The vibrant, exotic and delicious world of Indian food has found an ever-increasing fan base in Australia, and we all have our favourite local Indian restaurant with its menu of must-have favourite dishes. With its fantastic spices and countless variations, Indian cuisine can be a little difficult to match with wine and often people simply opt for a cooling beer when things get a bit too spicy. 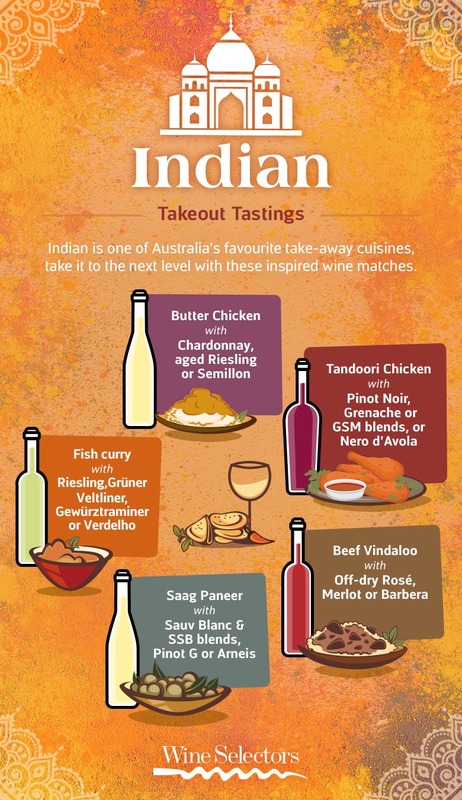 So, to help you get the most of out of your next Indian takeout order, we’ve put together this handy guide for pairing wine with some Australia’s most-loved Indian dishes. Light and aromatic whites work well with this vegetarian dish with its spinach base, cottage cheese and mild spices. Wonderfully fragrant and with an interesting texture, fish curry calls for white wines that are also aromatic and deliver lovely texture. Creamy, rich, full of flavour and with a delicious mix of spices, this popular dish calls for a medium weight white wine with good acidity. Tandoori chicken is aromatic and quite smokey and often tastes almost beefy, so a light to medium weight and savoury red is the best red wine pairing. For white wine lovers, a good Riesling is also an option. Sitting at the higher end of the spice-o-meter, Vindaloo is fiery and rich dish so avoid red wines with rich tannins as tannins will accentuate the heat. In general, when it comes to matching wine with Indian food, white drinkers are safe with a dry, savoury style like Riesling for its universal appeal, while Rosé is also another great multi-purpose option. For the red drinkers out there, light to medium weight and savoury reds are a good choice, with Merlot working well with dishes that have a bit of heat. Our final bit of advice when it comes to choosing wines to go with Indian food is to avoid overly tannic reds such as Nebbiolo, Cabernet Sauvignon, Tempranillo or Montepulciano, which will accentuate any chilli heat or bitterness within the dish.